Welcome to our newly released range of large rural built onsite Elix Liner Tank. They are truly Australian and built to last with all tanks being manufactured at our Mannum Tank Facility using tough Australian made Z450 Bluescope corrugated galvanised iron walls ensuring a strong and highly corrosion resistant tank, with no need for sacrificial anodes. All Bluescope Colorbond colours are available along with traditional galvanised finish. Each steel water tank includes our unique multi-layer internal liner manufactured from polypropylene with woven scrim fibres for extra strength and durability. The Elix Liner Tank range is available in sizes from 60KL to 275KL and are manufactured as a kit and assembled on site by our experienced installation team. There are 6 diameter options to choose from, and each tank can be customised with a wide range of fittings and accessories to suit your application. They are ideal for Rural applications such as water storage for high volume crop spraying, or CFS/MFS fire water storage applications. 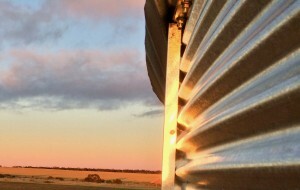 •Galvanised Bluescope corrugated iron wall, in traditional Galvanised finish, or with the full range of Colorbond© colours. •Large volumes of water can be stored effectively, negating plumbing of multiple tanks. We currently offer 60,000L to 275,000L capacities. Contact us for advice. •Our liner is AS/NZS 4020 approved for use in contact with Drinking Water. Also they are perfect for “hard water” (bore water, chlorinated water or river water) applications. •Fire storage tanks for both residential and business applications fitted out with relevant fire fittings and accessories ensuring compliance to AS 2419 for CFS and MFS applications. •Rainwater harvesting applications where medium to large volumes can be captured and utilised. Ideal for farms for stock water or spraying applications. •The Elix Liner Tank procedure of installation is unique to our industry; The LAST thing that’s installed is the liner. There is no chance of any contamination of your fresh water or any liner damage.All of the screwing, bolting, drilling, sieve and inspection hole cutting etc is done before we fit the geotextile underlay, followed by the liner, all with no screw holes needed in the liner to hold it in place! 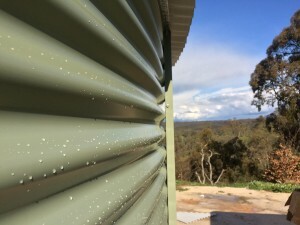 •Bluescope Galvanised corrugated wall in Galvanised appearance, or the full range of Colorbond© colours. No sacrificial anodes required, compared to Zincalume® walls. •Multi-layer heavy duty Polypropylene Liner with woven scrim technology. •Our liner is AS/NZS 4020:2005 approved for use in contact with Drinking Water. It meets all Government requirements for contact with drinking water both here in Australia & overseas. This means your water is kept clean & free from contamination. •Unique liner clip installation technology, negating any puncturing from screw holes, contamination of the water from drilling filings or rubbing of the liner due to trapped drilling swarf between the tank wall and the liner. •Geotextile membrane underlay to increase bladder protection due to punctuation by small stones or vermin (can pay up to $550 from some suppliers, as an optional extra). •Vertical externally braced double width bolt bridges on every vertical bolt line to add superior strength and rigidity over just a “nut and bolt” system. •Metal valve and 50mm corrugated flange outlet, for superior fire protection. •Inlet water sieve and light guard. •Square tube hot dipped Galvanised Roof Trusses. •Heavy duty full circumference Galvanised Top Support Ring. •20 year pro rata warranty. •Installation available throughout South Australia and Western Victoria. •Dust and vermin proofed roof, keeping the critters out. 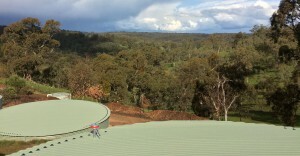 •Rainsaver water catchment system for the tank roof. •Telescopic access ladder for light duty applications. •Range of extra outlets and valves from 25mm up to 150 mm. •Range of fittings such as table D/E flanges, roll grooved couplings. •Internal anti vortex outlets for high pump suction applications. •CFS and MFS Fire hook up Fittings. Elix Liner Tanks offers a 20 year pro rata warranty, on both the Tank and Liner. A long lasting tank that you can rely on.